Happy Friday! I hope you've had a good week. I'm on the run today, so I'll keep my Friday Faves short and sweet. 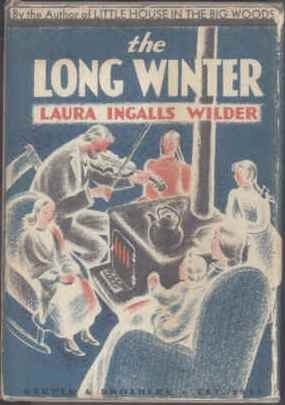 My first Friday Fave is The Long Winter by Laura Ingalls Wilder. Over the past few weeks, I've enjoyed participating in a children's literature group read of The Long Winter. This book, published in 1940, tells the story of the Ingalls family during the blizzard of 1880 - 1881 (South Dakota). The Ingalls family was living in a store building in the little town when the blizzard arrived. (You'll find photos of their actual home here: Frontiergirl website.) It is inspiring to read how the family pulled together to make do as food ran low, and they were snowbound inside. Laura Ingalls' future husband, Almanzo Wilder, is a hero of this book, as he goes with a friend, Cap Garland, to find wheat for the town. I have read all the Little House books many times, but had not read this one in quite a while. It was a perfect winter read -- and it made me grateful for our winter weather in the south, as variable as it may be. I'm also happy about the song "Happy" by Pharrell Williams this week. I usually listen to older music (oldies, jazz, Broadway), but this song is everywhere. I love it -- especially the line: "Clap along if you feel like a room without a roof." I'm sure I read that book when I was younger. Your post made me nostalgic for those stories. Greg, yes the Little House books do really bring an appreciation for the conveniences and ease of modern life! I love the resilience and spirit of the Ingalls family. Brenda, that is so neat about Pharrell Williams' hat selling for $44K for charity. Wow! I would love to see some of the Laura Ingalls Wilder homes and places of interest in person!